Diego Stocco – Bassoforte from Diego Stocco on Vimeo. Odds are you don’t have a dismantled piano you keep in the garden, awaiting conversion to a fantastic, imaginative electro-acoustic instrument. But that’s unlikely to make you covet the instrument above any less. Diego Stocco is a composer, instrumentalist, sound designer, and mad inventor. Among many recent accomplishments, he’s responsible, in collaboration with Hans Zimmer, for some of the imaginative sounds that populated Guy Ritchie’s “Sherlock Holmes.” In many ways, he’s a reminder that the expressive potential of digital music isn’t limited to the virtual. 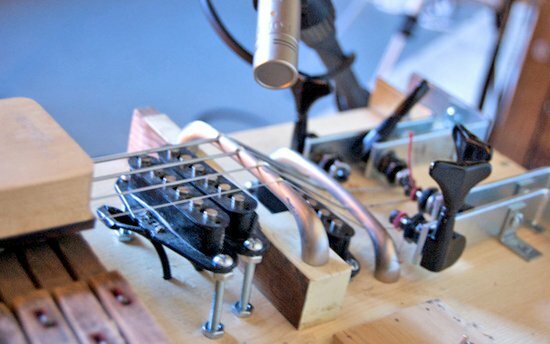 He couples raw acoustic materials from sand to modified instruments with recording and digital processes. In the case of the Bassoforte, that means the use of IK Multimedia’s tone-rich amp models and effects in their flagship AmpliTube software. Hold a mic to something, or add a pickup, and the sound takes on a new form. It came out fun to play because I can interact with it in different ways, but it’s also tricky to control, because the tuning is a thing on its own. The neck is slightly tilted, so when I press a key I can push all four strings at the same time. But because the piano keys are not perpendicular to the frets, the tuning is imprecise (which I like), and can also generate in-between semitones. How strong I push the keys also affects the tuning. It can be a little tricky to play, but overall, I’m very happy about how it came out. 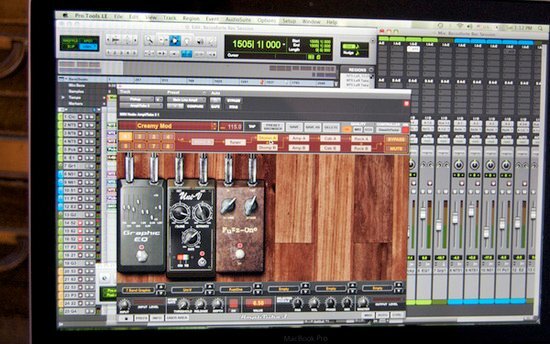 The software side: an AmpliTube effect chain and amp simulation, running inside Avid Pro Tools. I’m still discovering it because I just built it, but it sounds [as if] for each [note], there’s also a secondary note that gets produced by the other half of the strings (on the side of the bell), so the higher the pitch, the louder this secondary note is. It creates these bi-chords that can sound very interesting.